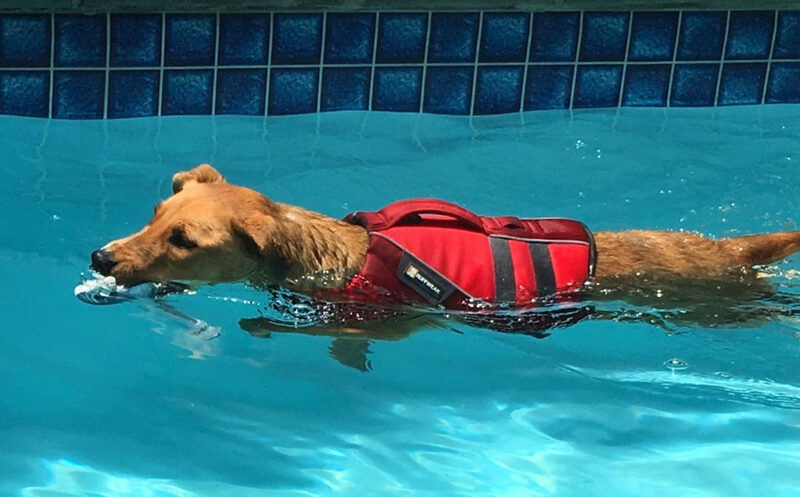 Hydrotherapy uses the properties of water (buoyancy, viscosity, resistance and hydrostatic pressure) to enable a dog or human to move their joints. The benefits of water exercise have been used for many years for humans and in recent years for animals, as almost every muscle is exercised without any impact on their joints and bones. It can be used for treating and rehabilitating arthritis, post-surgery and other types of muscle, ligament and tendon injuries. It can help other medical conditions as well as obesity and is great for general fitness. Benefits will be different for each case and patient treated. 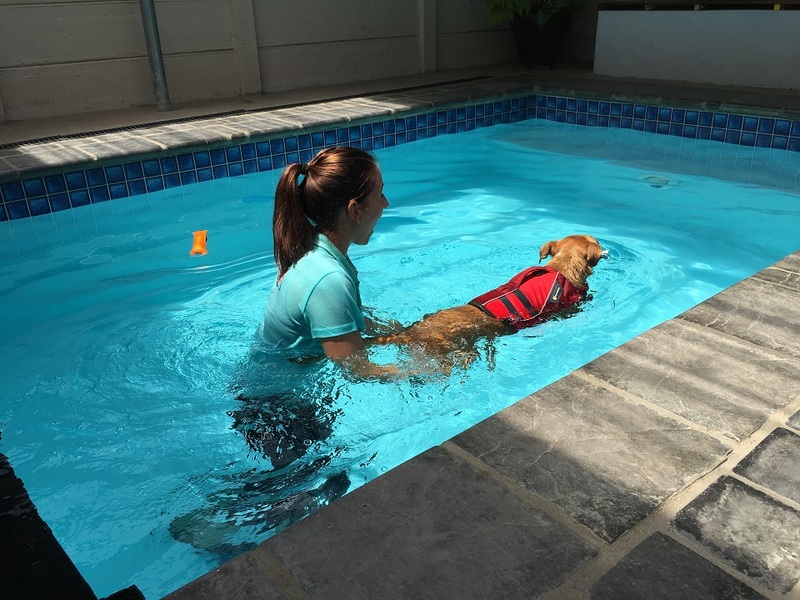 Hydrotherapy can be used to support dogs in a non weight bearing / partial weight bearing environment to allow them to move and use their limbs in a way which may not be possible on land such as dogs that are paralyzed, is injured or has had surgery. By simply swimming gently or floating and standing in the water , it can help to reduce pain and inflammation. It can benefit dogs that need to increase the use of their limbs , tone and bulk muscles and strengthen and support joints. If a dog has had surgery, hydrotherapy is used to allow earlier return to normal use. Hydrotherapy increases cardiovascular fitness which is great for weight loss and for improving general fitness levels. Bookings essential and full list of terms and conditions will be emailed to you when booking is made. In some cases even walking can be painful for dogs (it’s like a shockwave that travels up the limbs which is absorbed by bones, tendons and joints). With some dogs such as dogs recovering from surgery, doing exercises on land to soon can in some cases cause more damage or weaken the limbs recovering from surgery or injury. Swimming allows good exercise and strengthening of muscles without any impact. The water resistance allows dog to work harder to move through the water and muscles have to work harder than what they would on land. Can I swim my dog in the sea, pond, river etc.? Although this is free and pleasurable for your dog, the water temperature is generally unstable and cold. The cold temperature causes blood to move away from peripheral surfaces and limbs. It can also increase stiffness in dogs suffering with arthritis. Being in a pond, river, sea etc., a person can’t see if the dog is using their limbs correctly and could easily be over exercised because of currents and general fitness levels perhaps decreasing over a period of time. There is a risk of infection (waterborne diseases) , injuries (objects in water) and drowning. Bacteria/waterborne disease are important factors to consider especially if you have a dog with a compromised immune system.